Hello friends! I'm sitting alone in my house and I'm completely blissful! My family went to my in law's house for dinner and I just wasn't feeling well so I stayed home. I watched some Food Network, looked at some blogs, ate dinner on the couch, and I think I'm going to relax in my bed for a little bit after I write this post. 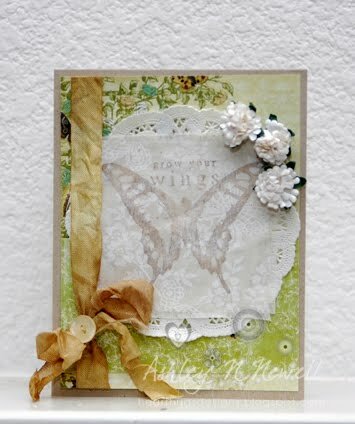 So, here's a card I made a loooong time ago for a WCMD challenge to stamp on fabric. I choose a bag that a bar of handmade soap came in. I think it turned out pretty well. Maybe darker ink would be nicer. Beautiful card! So elegant and lovely. Love all the details, from the ribbon to the flowers. Super pretty and really awesome card, Ashley! Glad you are enjoying your quiet time! Hope you are feeling better! This is such a pretty card! So feminine and soft!